Just as women face challenges in participating in the work domain, so men face challenges participating in the home domain. Emma Watson in her much-discussed UN speech observed that inequalities faced by women are everyone’s problem, and importantly, they are only a part of the problem. Just as inequalities are overlooked, so too are the solutions. Annabel Crabb recently observed that career women are frequently asked about how they manage their family lives while men never are. How are you managing your home life? This question offers more than a promise of equal treatment of working women and men. It also draws attention to the need for work at home. Unpaid household work is estimated to be equivalent to 50% of GDP. Who does this work? Women do. At a rate almost two times that of men and even greater if they have children. However, while women do about two-thirds of the unpaid household work, men do about two-thirds of the paid work. These ratios have changed little in the last decade, suggestive of a norm. What little change has been observed is women entering the workforce rather than men leaving. Work at home still needs to be done leading to what Crabb dubs The Wife Drought. Paid work offers attractive benefits, but it also has costs. Work is harmful to health and safety. Men have higher rates of the work-related injuries, partly due to their job choices and higher participation. And whether related to their greater engagement with the public sphere or not, men also experience higher rates of victimisation by crime, suicide and earlier death. So why are men not leaving the work place simultaneously easing his own burden at work and a woman’s burden at home? 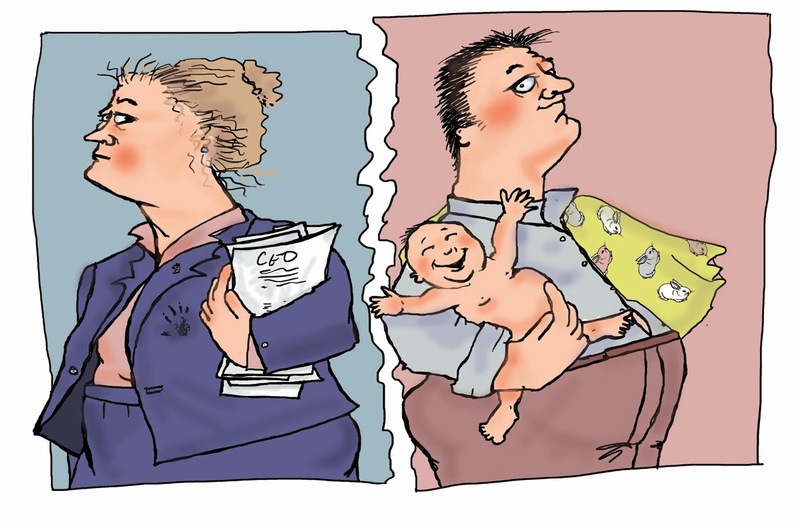 Well, fathers who might most qualify for this job-swap face mixed signals. While data show there has been a marked increase in stay-at-home fathers in the US over two decades, this growth is from a small base having little impact on male participation at work. Fathers are given little encouragement as people place less value on fathers-at-home than mothers. Various sources suggest that men are even discouraged from engaging in activities related to children. Charles Areni and I in our book The Other Glass Ceiling provide other instances: a dad shopping for his daughter’s undies is deemed a security risk; a single father searching for an au pair is suspicious. Our research shows that 95% of people presume that Chris in the first scenario is a woman, and 82% presume that Terry in the second is a man. However, the gender was not stated in either scenario. It appears that we associate the failures with gender-role reversals, even if unconsciously. For better or worse, our social systems are highly specialised with roles in the home and family remaining relatively unchanged. Gender role specialisation is changing, but slowly. The participation by women at work and men at home are increasing as roles are apparently more negotiated than presumed. Perhaps a limiting factor is that complete equality may be unattainable. While greater male-involvement at home could reduce the child-rearing burden faced by women, he cannot reduce a woman’s burden - and privilege - of being able to bear a child (as attested to by Monty Python). In the working domain, progress is made as we see men letting go and women stepping up. This effort can be complemented in the home domain with fathers stepping up and mothers letting go. Read the other pieces in our Gender equality at work series here. Thanks for this. Let me know what you're seeing and your browser. I have blue links (mauve when I go over them), both visible on a white background, in both Chrome and IE.